Graduate Civil or Mechanical Engineer with 5 years exp in all related Aluminum faced works. GCC experience required. Graduate Mechanical or Civil engineer with 5 years experience in all related Aluminum faced technical experience to control technical & design department. GCC experience required. Graduate Civil or Mechanical engineer with 2 to 5 years experience in quantity survey & estimation experience in Aluminum faced contracting. GCC required. Minimum +2 with 5 years in Aluminum façade installation and execution. GCC is required. Graduate Cvil Engineer with 2 to 5 experience in Civil construction related all activities. 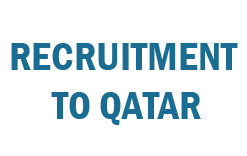 Graduate with GCC experience & Driving License, Marketing related coordination knowledge. Attractive Salary + Food and Accommodation Provided.